22 LISTS Makeup JunkiesGet face-to-face expertise for your look from the best women and men in the biz (and on the Internet). When Percem Akin, a makeup artist from Turkey, posted a racially-charged tutorial of herself in Halloween blackface, she was met with consternation from around the globe. Bloggers, vloggers, and social media users breathed a collected "This again?" sigh as Akin tried to explain herself. But, as with other people who have feigned or claimed ignorance on the topic, she was dragged by social media to the point where she deleted her accounts—at least for a little while. And with good reason. While things seem to have blown over, there are still people, especially at this time of year, who are posting costumes of themselves as different races. And that is not, and has never been okay. There are plenty of things on Halloween that could get you into trouble, and costumes are some of them. 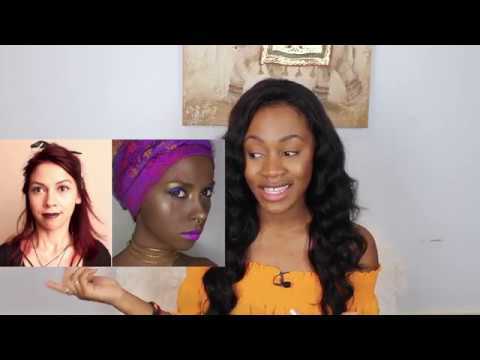 These bad makeup ideas are offensive, and this Turkish makeup artist's blackface tutorial even more so. In Akin's case, she hopefully learned a valuable lesson about cultural appropriation, racism and the history blackface and what her actions actually represent. Akin shocked the world by darkening her skin to make her look black. She turned herself into a person of a different race—but that wasn't all. To complete the look, she wore a headscarf and created scars on her face. She posted a how-to video to YouTube with a still photo of the look on Instagram. It didn't go unnoticed for very long. To make matters worse, Akin tagged her photos on Instagram with the terms #blackwoman and #sadmakeup. While those (and the photo) were offensive enough, the tag #slave is what put social media over the top and the question was asked a multitude of times—"How is this ever okay?" As word got out, social media users across all platforms were outraged by not only the photo and tutorial but the hashtags. Akin went viral, but never in the way she had intended or imagined. Initially, she didn't understand what the issue was and defended herself by saying the look was for a movie. As the resentment continued to build, she shut down her accounts and apologized saying, "We are not living in America or Africa, so finding any black model is so difficult in here. I have never think that this is racist while I am doing this. I just try to see pure beauty behind the pain who have it," she later told Buzzfeed.